Moisture Analysis Balances, could they be perfect for you? Moisture Analyser Balances are analysis scales which can be used as conventional balances as well as for determining the dryness of contents. With an attached kiln, samples can be dried for determining the moisture content of the sample. (PM) Meschede, 06.12.2012 - Moisture Analyser Balances are analysis scales which can be used as conventional balances as well as for determining the dryness of contents. With an attached kiln, samples can be dried for determining the moisture content of the sample. The appropriate moisture content can then be calculated by using special software. PCE Instruments have a well-stocked assortment of Moisture Analyser Balances. These balances are mainly used in the industrial sector and for commercial purposes. Inside the balance, samples are exposed to a drying process by quartz glass radiators. By measuring the difference of masses before and after the drying process, the moisture content of the sample can be determined. During the drying process, the decreasing moisture content of the sample is shown on the display. PCE-MB Moisture Analyser Balances are the ideal devices for determining the moisture, dry matter and consistency of volatile and solid materials and substances. The analysis of pastes, coatings, adhesives, wood materials, various powders, etc. is carried out mainly in the industrial production and quality control. These Moisture Analyser Balances are equipped with a modern and high-quality system with all the necessary features for not only weighing the absolute, but also weighing the specific moisture of samples. What is more, there are also quite conventional measurements possible when the moisture value is not required. 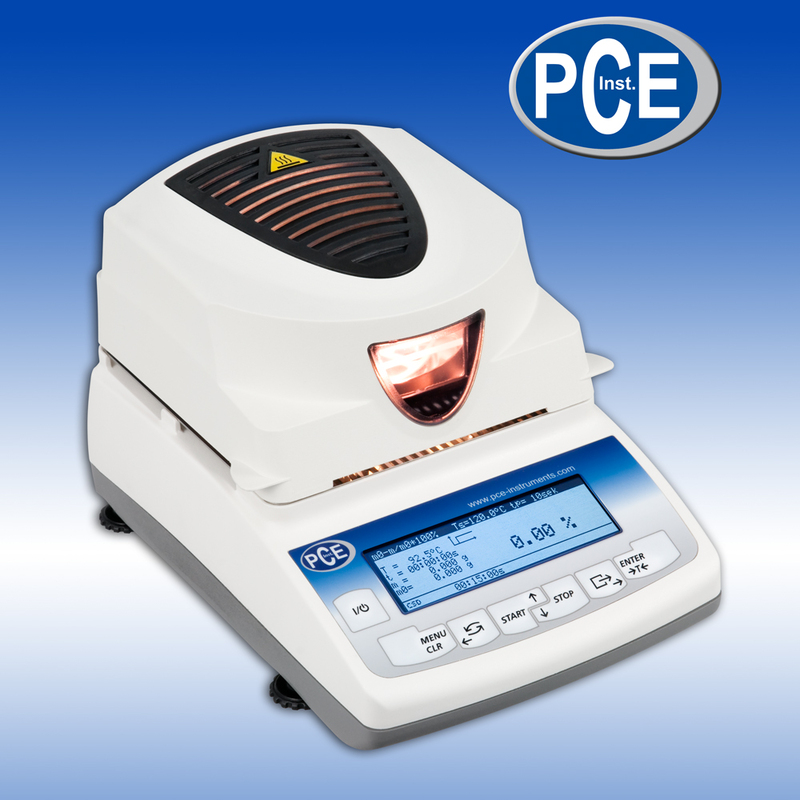 Whenever it comes to measurements of humidity of certain substances, the Moisture Analyser Balances of the PCE Instruments are a good choice. These balances convince with a very good quality and price-performance ratio. ÜBER PCE INSTRUMENTS UK LTD.